The FLEX.US ultrasonic leak detector kit comes with the FLEX.US unit, carrying case, and manual and utilizestwo AA alkaline batteries(included). 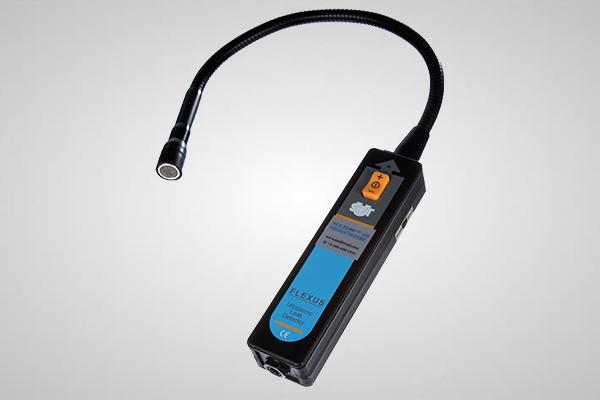 The FLEX.US is a complete kit – the high quality flexible sensor is mounted on the end of a flexible steel pipe so the ultrasonic sound can access hard to reach areas. The unit converts the ultrasonic noise of a leak into a sound humans can hear (hissing sound) and not just some beeping sound or LED display that may not distinguish a leak sound fromother phenomenon. The headset has excellent noise attenuation for use in the noisiest of environments. A rugged carrying case protects your FLEX.US when not in use. The FLEX.US is a solid tool – built to last, it is easy to use and will providemany years of service. The Flex.US Ultrasonic Leak Detector has the sensor on the end of a flexible pipe to allow detection of leaks in difficultto reachareas. 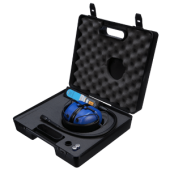 The Ultrasonic Leak Detector comes in a handy carrying case to store the unit and quality headphones. The headphones are durable and of high quality to cut out extraneous noise that would make it difficult to detect leaks. Quality head phones block out plant noise to make it easy to listen for, and locate an air leak with the Flex.US system. Ultrasound is beyond human hearing capacity. Most humans hear frequencies from 2- Hz to 20 kHz. Ultrasonic sound is beyond thisrange at 20 kHzto 100 kHz. The FLEX.US unit convertsthe ultrasonic sound to an audible range to humans. Compressed airleaks generate thisrangeof ultrasound “noise” thatthe unit picks up. Look at the headphones. If they are an open walkman style,these will be useless in a noisy plant because they offer absolutely NO protection from the ambient noise which can be at high levels! (After all, why else would you need an ultrasonic lead detector!) So how can you hear the leak in the headphone without protection from the ambient audible noise in the plant? Our headphones completely cover the ear providing 130 dBA hearing protection. 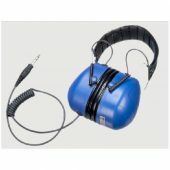 Some competitive units would not be useable in a typical factory where hearing protection is mandatory because the inspector would have to insert ear plugs in his ears. Our headphones don’trequire this. Look at frequency range. Our frequency is centered at 38.4 kHz with an open window of +/- 2 kHz. By having a bandwidth this narrow we are able to eliminate other sources of ultrasonic parasite noise. It is absolutely critical that you amplify just this narrow single harmonic band ofsound. Some detectors amplify every frequency from 20 kHz up to 100 kHz. That’s because the manufacturer did not include any low pass filters. This also affects the output signal in the headphones. It also affects the directionality of the device. At low frequency it is much more difficult to know where the sound is coming from because the wavelength is larger andmore reflective. The FLEX.US ultrasonic leak detector kit comes with the FLEX.US unit and manual and utilizes two AA alkaline batteries (included). 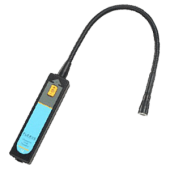 The FLEX.US is a complete kit – the high quality flexible sensor is mounted on the end of a flexible steel pipe so the ultrasonic sound can access hard to reach areas. The unit converts the ultrasonic noise of a leak into a sound humans can hear (hissing sound) and not just some beeping sound or LED display that may not distinguish a leak sound from other phenomenon. 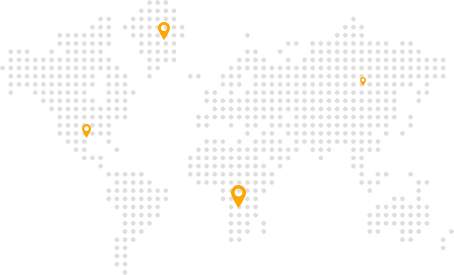 The FLEX.US is a solid tool – built to last, it is easy to use and will provide many years of service. Nex Flow™ aims to be the lowest cost where possible but NOT at the expense of sacrificing quality.